Newark, NJ passed away Tuesday, January 15, 2019. Tahira was preceded in death by her mother Elizabeth (Baby) Howard, her father Willie Taylor and brother John Walker. 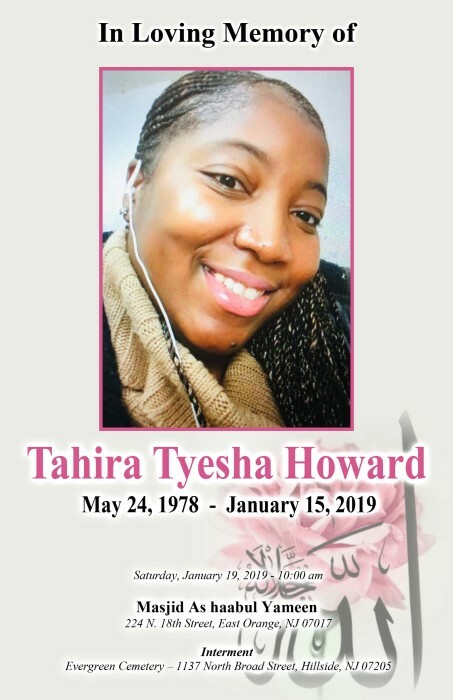 She is survived by her fiancé Timothy Best, daughter Samiya Howard, siblings, Tasha-Howard-Moore, MuJihad Howard, Hakima Howard, Samada Howard, Albert Walters, Odell Walters, Jewia Taylor, Jonathan Taylor and Willie Ruff. Uncles, Ernest Howard, Terry Howard and Issiah Howard.Tahira will also be forever remembered by a host of nieces, nephews, extended family and dear friends.